The 2004 United States presidential election in Texas took place on November 2, 2004, and was part of the 2004 United States presidential election. Voters chose 34 representatives, or electors to the Electoral College, who voted for president and vice president. 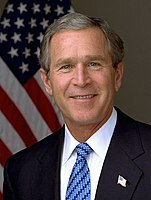 Texas was won by incumbent President George W. Bush by a 22.9% margin of victory. Prior to the election, all 12 news organizations considered Texas as a safe red state for President Bush. The Lone Star State is a Republican stronghold and is his home state. As of the 2016 presidential election[update], Texas has not voted for a Democratic candidate in a U.S. presidential election since Jimmy Carter's victory in 1976. Although John Kerry lost Texas, this is the last time, as of the 2016 presidential election[update], the Democratic candidate lost the state with less than 40% of the vote. Likewise, Bush is the last Republican to win any of the following counties: Bexar, Cameron, Culberson, Dallas, Frio, Harris, Reeves, Val Verde, and Kleberg County. This was the first election a county in Texas (Harris) cast more than a million votes. There were 12 news organizations who made state-by-state predictions of the election. Here are their last predictions before election day. Bush won every single pre-election poll, and won each with at least 55% of the vote and a double-digit margin of victory. The final 3 polls averaged Bush leading 59% to 37%. Bush raised $23,776,943. Kerry raised $5,554,831. Neither campaign advertised or visited this state during the fall election. Texas, located in the South, has become a consistently Republican state at all levels. Economically and racially diverse, Texas includes a huge swath of the Bible Belt where many voters, especially those in rural Texas, identify as born-again or evangelical Christians and therefore tend to vote Republican due to the party's opposition to abortion and gay rights. Although once part of the Solid South, the last time Texas voted for a Democratic presidential nominee was Jimmy Carter in 1976. George Bush achieved his party's best result in Texas since Ronald Reagan's second landslide in 1984. President Bush carried 236 of the state's 254 counties, improving on his performance from 2000. East Texas, historically the most Democratic region in the state, also swung more towards the Republican Party. South Texas, while still losing the region heavily to Senator Kerry, swung towards Bush as well. The only regions to swing in Kerry's favor were parts of Metro Houston, the Dallas Fort Worth Metroplex, and the Austin area. Out of the three regions, only Travis County in the Austin area flipped back into the Democratic column due to the city's strong liberal leanings and opposition to the Iraq War. Bush won 25 of 32 congressional districts. Technically the voters of Texas cast their ballots for electors: representatives to the Electoral College. Texas is allocated 34 electors because it has 32 congressional districts and 2 senators. All candidates who appear on the ballot or qualify to receive write-in votes must submit a list of 34 electors, who pledge to vote for their candidate and his or her running mate. Whoever wins the majority of votes in the state is awarded all 34 electoral votes. Their chosen electors then vote for president and vice president. Although electors are pledged to their candidate and running mate, they are not obligated to vote for them. An elector who votes for someone other than his or her candidate is known as a faithless elector. The electors of each state and the District of Columbia met on December 13, 2004, to cast their votes for president and vice president. The Electoral College itself never meets as one body. Instead the electors from each state and the District of Columbia met in their respective capitols. ^ "2004 Presidential General Election Results - Texas". ^ "Federal Elections 2004" (PDF). This page was last edited on 31 January 2019, at 12:42 (UTC).